This is what all followers are told to believe fully. His doctors, especially Dr. Safaya, certainly doe not credit his god-guru’s words, however. Backed by the massed doctors, it was proclaimed that Sai Baba needed rest. He is still getting rest too, if lying in intensive care on a ventilator while being pumped of lung congestion and pumped with medicines and sustenance (because he can’t eat) can be called rest. Yet why so many Sai Baba devotees are so worried and distraught as to try to force entrance to the hospital to see their Swami in his incapacitated condition and so on shows only that they are very badly informed about what Sai Baba has said on diverse occasions. It is common for most devotees to disregard anything that does not fit with their pet beliefs, as I experienced countless times in my 18 years as a leader in the Sathya Sai Organization. 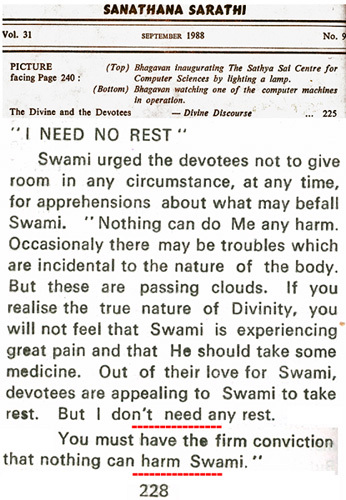 However, perhaps they are beginning to see that their doubts about the omniscience and omnipotence – so often proclaimed proudly by Sathya Sai Baba – are justified? Whatever the case, their behaviour is farcical in view of Sai Baba’s lifelong repetitions of his assurances that nothing in this world is real and one should not concern oneself with mere ‘passing clouds’ but only be devotes to God.